In an interview last month, Scott Roeder admitted killing Dr. George Tiller. He planned to argue the shooting was justified. (CNN) -- An anti-abortion activist charged with gunning down a Wichita, Kansas, doctor cannot use the "necessity defense" at trial, a judge ruled Tuesday. Scott Roeder, 51, is set to stand trial January 11 on one count of first-degree murder in the death of Dr. George Tiller, who was shot to death at his church May 31. Tiller ran a women's clinic in which he performed abortions. Tiller, 67, was one of the few U.S. doctors who performed late-term abortions. He had already survived one attempt on his life before he was slain. Under a necessity defense, a defendant argues an action was justified because breaking the law was more advantageous to society than following it. 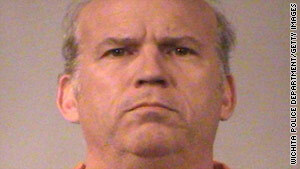 Several anti-abortion activists facing criminal charges have attempted to use the defense but none has been successful. In an Associated Press interview last month, Roeder admitted killing Tiller and said he plans to argue at this trial that the shooting was justified. "Because of the fact preborn children's lives were in imminent danger, this was the action I chose," he said. "... I want to make sure that the focus is, of course, obviously on the preborn children and the necessity to defend them." Roeder's comments prompted prosecutors to file a motion asking Sedgwick County Judge Warren Wilbert to bar Roeder's attorneys from using the defense. Wilbert noted that the Kansas Supreme Court, in a previous case regarding blocking entrance to an abortion clinic, ruled the necessity defense cannot be used when the harm the defendant claims to be avoiding through his or her actions is a constitutional and legal activity, and the defendant broke the law. That precedent, Wilbert said, required him to rule that the necessity defense is not a viable defense in Kansas or in the Roeder case. Defense attorney Mark Rudy pointed out to Wilbert that the defense team has not yet acknowledged what their tactic might be. Roeder, however, filed a 100-page motion on his own behalf, Sedgwick County District Attorney Nola Foulston said Tuesday, on the necessity defense, acknowledging it previously has been unsuccessful. Prosecutors also asked Wilbert to bar Roeder's attorneys from claiming his alleged actions were justified because he used force in the defense of another -- the unborn. Wilbert said that would require further argument -- particularly an offering from defense attorneys regarding the evidence they plan to present in support of that premise at trial. "I will leave the door open on the issues surrounding use of force in defense of another," the judge said, adding he does not mean it's "wide open." Under the law, such a defense can only be used if a defendant was preventing unlawful conduct. Foulston argued that Tiller posed no threat that would justify his shooting. "Dr. Tiller was not an aggressor," she said. Roeder is also charged with two counts of aggravated assault for threatening two church members. Dressed in a coat and tie, he conferred with his attorneys and listened intently to the arguments on Tuesday. In a June interview with CNN's Ted Rowlands, Roeder would not admit that he killed Tiller, but said that if he is convicted, "the entire motive was the defense of the unborn." Roeder's attorneys also argued Tuesday that the trial should be moved outside Wichita because extensive pretrial publicity in the case could have tainted the jury pool. Foulston, meanwhile, noted that Roeder, who has talked often to the media, brought some of that publicity on himself. Wilbert said 300 jury summonses have gone out in the case, and he was optimistic that some impartial jurors could be found. However, he said he would revisit the issue later if the court experienced difficulty in picking jurors. Rudy also asked that the judge prohibit prosecutors from excluding potential jurors because they have anti-abortion beliefs. The judge said he was confident that some individuals who are anti-abortion would still be able to make an impartial decision, but suggested the issue be examined on a juror-by-juror basis if the court recognizes a pattern of exclusion during jury selection. "I can't make a pretrial ruling and just make a broad-brush approach," he said.